A sculpture garden graces the entrance to the Museum Building which houses a selection of Shin Hongo’s sculptures. The works of Shin Hongo are exhibited permanently along with regularly curated visiting/special exhibits. Cultural and arts related meetings, lectures, and performances reflecting the personality and work of Shin Hongo are regularly scheduled and offered to the public. From Nishi 28-Chome Subway Station (Tozai line), transfer to JR Hokkaido Bus Yamanote Line No. 20, get off at Museum of Sculpture Entrance (Chokoku Bijutsukan Iriguchi) stop. From there, follow street signs to the museum. It is an approximate ten-minute walk uphill to the museum. The museum is located approximately 15 minutes west of downtown Sapporo. Free parking is available for up to ten vehicles. Admission is free for children through junior high school, seniors over 65, and the disabled. Entrance fees vary and are announced in advance. Entered The Head of Girl in the Kokuga Sosaku Kyokai Art Group Exhibition, winning his first major prize. Began an apprenticeship with Kotaro Takamura. Became a member of the Kokuga Sosaku Kyokai Art Group and began pursuing his interest in creating large scale works. Left the Kokuga Sosaku Kyokai Art Group, and participated in the formation of the Sculpture Division of the Shin Seisakuha Kyokai Art Group alongside Takeo Yamanouchi, Churyo Sato, and Yasutake Funakoshi. Published a collection of theses on sculpture, The Beauty of Sculpture, through Fuzanpo Publishing Company. Voices from the Sea, in remembrance of students killed during WWII, was commissioned by Wadatsumi Kai, and installed at Ritsumeikan University in Kyoto. This work received the Japan Peace Culture Award. Sent his wood carving, Wailing, to the Japan International Art Exhibition sponsored by the Mainichi Newspaper. From 1959 to 1968, he served as a judge in the Kotaro Takamura Prize Competition. Mother and Children in the Storm was erected in Hiroshima's Peace Park. Participated in the International Sculpture Symposium promoted by the Asahi Newspaper. The Sakhalin Memorial Monument, The Gate of Ice and Snow, was erected in Wakkanai. Woman Holding a Bird was displayed at the International Modern Sculpture Exhibition sponsored by the Rodin Art Museum in Paris. The Hokkaido Pioneer Memorial Monument, Group of People in the Wind and Snow, was erected in Tokiwa Park, Asahikawa. Dancing in Snow Flora at Makomanai and Bouquet at Gorin Ohashi Bridge were erected as Sapporo Winter Olympics monuments. Symbolic monument of the National Athletic Meet, A Poem in Praise of the Sun, was erected in Kagoshima. Statue of the renowned Japanese poet Takuboku Ishikawa was erected in Kushiro. Symbolic monument of Osaka, A Poem in Praise of Verdancy, was erected in Nakanoshima Park. Held the Hongo Shin 50 Years of Sculpture Commemorative Exhibit displaying his own works in Tokyo and Sapporo. Received the 30th Hokkaido Newspaper Culture Prize. Died of lung cancer at his home in Tokyo on February 13 at the age of 74. Over 1,800 of sculptures, oil paintings, watercolors, drawings, prints, handcrafts, and calligraphies. Materials related to Shin Hongo: work tools, personal articles, miscellaneous objects, and books. As a student of sculpture, Shin Hongo formed a primary interest in the works of Michelangelo and an appreciation for the works of Rodin. After graduation, he created Sculptures in Society Space as an expression of his personal ideal of life-sized formative art based on realism. Seinen Zazou is a western inspired expression of the youthful spirit. This esquisse was installed at the Gorin Ohashi Bridge in Makomanai, sight of the 1972 Sapporo Winter Olympics. The two figures with windblown cloaks, bouquets in hand, expressed Welcome to Sapporo to all athletes and visitors attending the games from around the world. 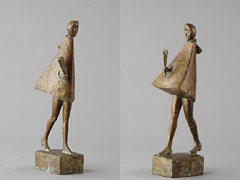 Memorial House exhibits Shin Hongo's sculpture, oil paintings, sketches, and woodcut prints. Additionally, tools, books, personal articles, and works of other artists collected by Shin Hongo are on display. 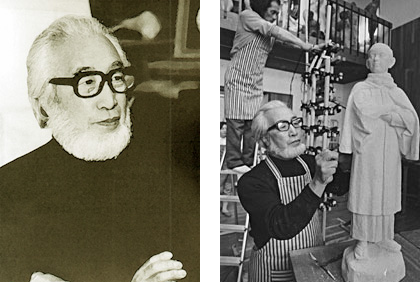 Shin Hongo donated his studio, gallery, grounds, and art works to the City of Sapporo. The grounds are located in the Miyanomori residential neighborhood of Sapporo's Chuo Ward. Shin Hongo died at the age of 74. 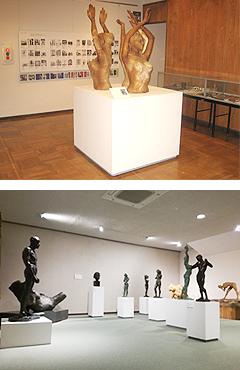 The Sapporo Museum of Sculpture was established as a foundation in cooperation with the governments of Hokkaido and the City of Sapporo. The studio and gallery were converted into the Shin Hongo Memorial House. Land adjacent to the Memorial House was purchased, and construction of the new museum building began. Repairs to the Memorial House were completed. 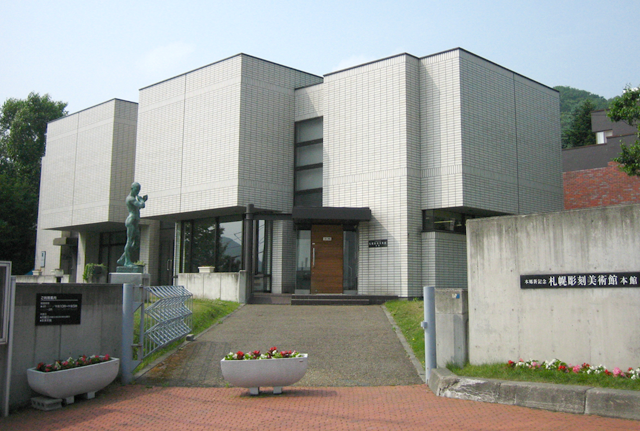 The Sapporo Museum of Sculpture was officially designated a public facility. The newly constructed and renovated facilities, including sculpture garden, opened to the public. Copyright © Hongo Shin Memorial Museum of Sculpture, Sapporo All Rights Reserved.